a book chick: "My Name is Lucy Barton"
"My Name is Lucy Barton"
my take: I borrowed this from the virtual library to read on my Kindle ... not a super big fan of reading on devices. Okay. Not a fan. AND I've been buying waaaaay too many books lately. I mention this Kindle thing because it's hard to gauge how big a book is on the Kindle ... they all feel the same. After I'd read a few pages the level indicator thing said 2 hours and 38 minutes ... so I think this isn't a very long book. A fast read in that sense, and not a breezy read. Haunting is the word I'd use to describe Lucy's account of her life and relationship with her mother. Lucy grew up the youngest of three children when they were next to homeless: living in the garage of a relative. There are many unforgettable images in the story and the one that sticks out is while Lucy is in the hospital for six weeks trying to recover from an undiagnosed illness, she's on a gurney in a hallway outside of a room that has yellow tape on the door - indicating a patient with AIDs. As Lucy looks into the room she can see a gaunt man looking at her and he does not look away. Ms. Strout has written a novel(la) that does not look away from pain and suffering. It's hard to look. It's easy to turn away. This message seems crucial in our divisive times as we all look to be heard, and seen, and to belong. I give it 4 out of 5 stars on the Kindle app ... I can see that if the reader were in a certain mood Lucy might seem sappy-ish. I was in the mood to be moved and it was a well-timed read for me. 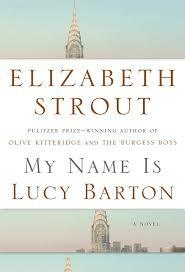 my source: big Elizabeth Strout fan - especially after hearing her at FF&W some years back. Also love her Olive Kitteridge and Amy and Isabelle. This was a surprisingly fast read for how quiet it is - not a page turner in terms of plot but definitely in terms of characters. I love it. But then I'm an Elizabeth Strout fan too! I loved this book. It could have been sappy and simplistic but it wasn't. The relationship be mother and child/daughter was complex and real and was true about many relationships in our lives. Complex with hurts and rewards and necessary. Just finished this and loved it too. Had to come here to see what you thought : ). Your term "haunting" is a good one, Lee. The sparse language is perfect for recalling memories just as they are: explicit in some ways, fuzzy in others, and unrepeatable in the worst. Different from so many other "I grew up poor and abused" stories in this way.